Your Central Park Bike Tour is Over, But You’re Not Done Yet: What to Do? If you are a local then Central Park bike tours may seem silly, but there is so much more to these tours other than a loop or two around the park and a few regurgitated historical facts. These Central Park bike tours offer a wide range of health benefits, but that’s neither here nor there. The real adventures lie just beyond that guided Central Park bike tour you just finished. It is their job to get you acquainted, but it is your RESPONSIBILITY to get intimate with Central Park. Whether you are cycling as fast as you can for effective exercise, enjoying the lustrous foliage, or just looking to get away from all of the hustle and bustle of the big city, a Central Park bike tour is the perfect way to escape the daily blues. So, you’ve finished up your tour and there’s still some bike rental time left. Mine as well enjoy it by exploring Central Park with your very own personalized bike tour. Where the tour went left, now it’s time we go right! Check out these ways to take your Central Park bike tour off the beaten path and into some rich adventure. Wandered too Far? Lamp posts will Show You How to Find Your Way! After you’ve completed one of the many Central Park bike tours; going back through can be fun or a little intimidating. For some with a great sense of direction, it’s a breeze venturing into a newly learned area, but for others, it can become a nightmare. If your guide failed to mention this one critical piece of information, no worries. Getting lost doesn’t have to be a hassle. Each of the 1600 lamp posts inside the park has a sequence of numbers on them to help aid you back to familiar ground. Of the four numbers on the post, the first two dictate the closest street. The other two numbers on the post let you know if you are on the east or west. Even values indicate east, while odd digits signify west. Even when you are solo, Central Park has your back. Never get lost again after a Central Park bike tour with this tip! The British Thought They Had Us in the War of 1812, But New York Was Ready! No, we aren’t on the shores of Tripoli, but Central Park is home to one of the oldest highways in New York and it was also a battlefield in 1812. The old highway was recently discovered by Richard Hunter and is historically known as Kingsbridge Road. The highway is comprised of cobblestone. Americans feared an attack on New York from this highway at the time. So, an impressive defense system was constructed. Fort Clinton, Nutter’s Battery, and Fort Fish hugged this highway and Kingsbridge is considered one of the oldest highways that send you out of New York. Trekking the North End After Your Central Park Bike Tour. Now, for those who will not let their Central Park bike tour rental keep them from piquing their exploratory curiosity. While there are some Central Park bike tours that do venture into the northern section of the park, hidden secrets are often only mentioned during the tour, due to the difficulty of getting to them, but not for you. You’re ready to hunt down these secrets and even though your NYC bike rental can’t climb small hills. For you, the gratification of hopping off to get a look is unmatched. 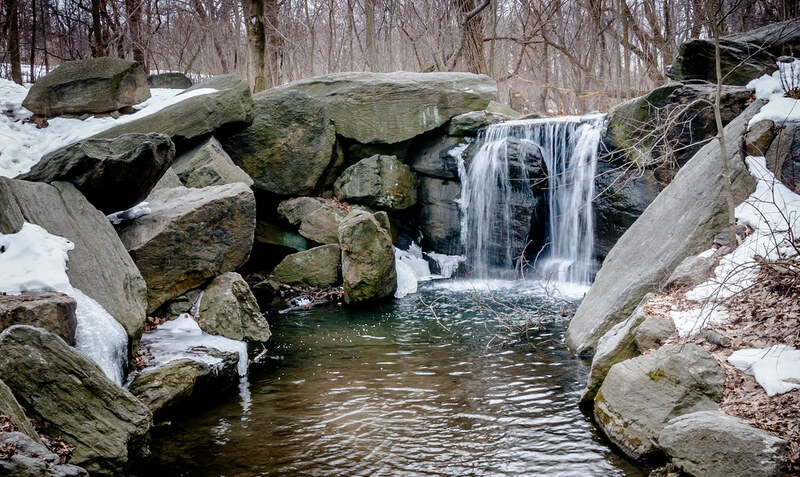 Central Park’s North Woods is home to several beautiful waterfalls, some in plain sight and some tucked away in the thickness of the woods. Dare to explore?